A couple of decades back. Bangalore had more houses than apartments. Standalone houses with their own little patch of green were the norm rather than exception. Today, with high-rises mushrooming across the city, houses have been disappearing quietly. To bring back the era of houses, LGCL or Lalith Gangadhar Constructions Pvt. 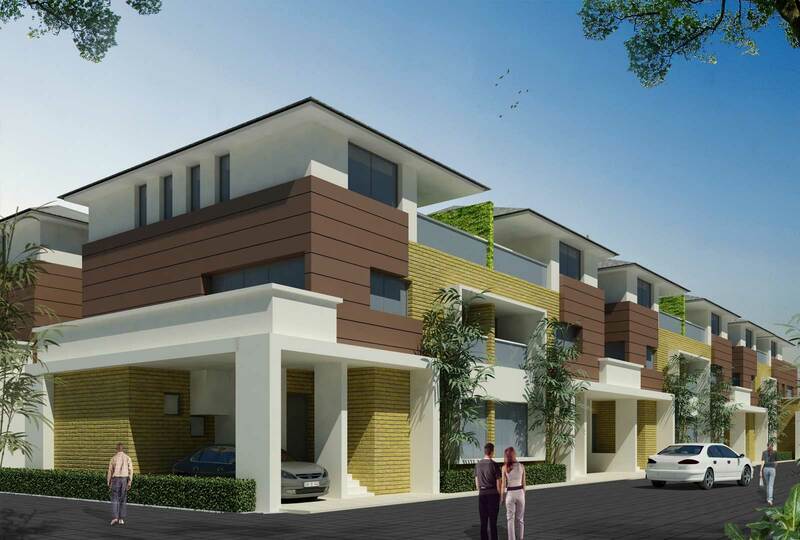 Ltd, has been working steadily by creating niche villas that usher in the bygone charm with a contemporary edge. LGCL, launched in 2008, has made tremendous progress by delivering villas that are of high quality and affordable pricing. ‘Although the location changes, the design changes – specifications remain standard across all villas and are of top quality”, says Girish. So far, the company has launched projects off Sarjapur road. Old Airport Road and Hennur Road, with Girish assuring that. 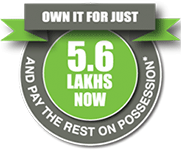 “ you can expect LGCL villas now in JP Nagar, Whitefield and Yelahanka as well. “ Each of the villa projects adheres to a unique theme that is immaculately adhered to in design and form. Ashlar is located off Sarjapur Road near the Amrita Institute of Technology, Outer Ring Road and Wipro Campus. It is also a short drive from Koramangala. The villas are priced from Rs. 2.7 Cr onwards. This project is located in the neighbourhood of Indiranagar and in proximity to Hotel Leela Palace. the Villas cost from Rs. 2.33 Cr onwards. Bamboo forest is located just off Sarjapur Road in the vicinity of HSR Layout. With two types of villas on the offer, the price begins from Rs. 1.67 Cr onwards. The exclusive Beautiful World is coming up in North Bangalore on the main Hennur Road. the Villas cost Rs. 1.96 Cr onwards. LGCL villas to watch out for are – Stonescape that’s coming up off Hennur Road, Pueblo (Spanish themed villas) which is off Sarjapura Road, One street (Victorian Styled) off Hennur Road, English Homes in JP nagar and Balinese styles villas at Yelahanka. these Villas would be priced between Rs.1 Cr to about Rs. 3 Cr. AllLGCL villas have exacting architectural details that match the theme of the villas. Each of the villas has high grade specifications, quality fixtures and accessories, vast and Feng Shui complaint floor layouts. Amenities like clubhouse, swimming pool, game facilities and other perks are added to suit the varied requirements of the residents. 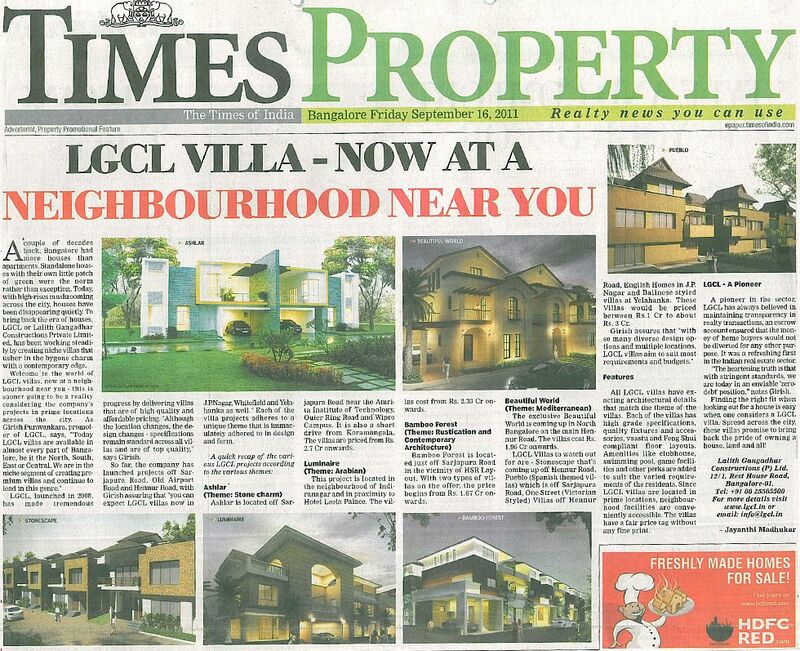 Since LGCL villas are located in prime locations, neighbourhood facilities are conveniently accessible. The villas have a fair price tag without any fine print. A Pioneer in the sector LGCL has always believed in maintaining transparency in realty transactions, an escrow account ensured that the money of home buyers would not be diverted for any other purpose. It was a refreshing first in the Indian real estate sector. “The heartening truth is that with stringent standards, we are today in an enviable ‘Zero debt’ position,” notes Girish. Finding the right fit when looking out for a house is easy when one considers a LGCL villa. Spread cross the city these villas promise to bring back the pride of owning a house, land and all!